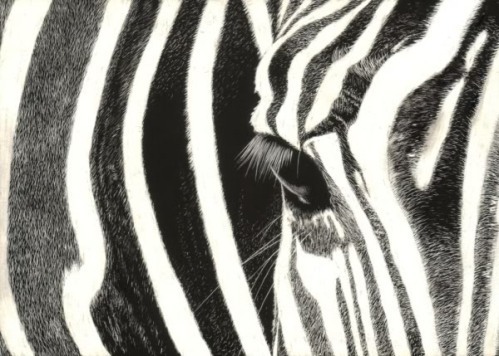 Here’s a step by step approach to creating a zebra in scratchboard. It’s all very simple and goes to show how good zebras are in art. Their stripes create such great designs that something fairly simple can look quite good. It’s only small, 5″ x 7″ on black Ampersand. 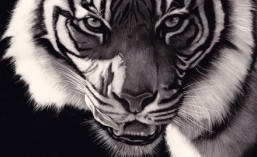 Firstly I cleared the white stripes with a curved blade. No finesse here, just back to black and white. Then I did the eye and scratched away at the black stripes to get the hairs looking right making certain to follow the hair direction carefully. And finally I added colour with a combination of watercolours and coloured pencils, keeping it all fairly muted to allow the black and white to do the main work, rescratching where the colour has been added. A tweak of the eyelashes and that’s it. I hope that has been of use to someone.